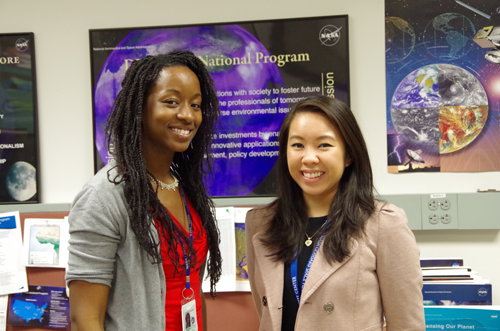 Today let us introduce you to Katrina Laygo and Melissa Oguamanam from NASA’s Goddard Space Flight Center. Melissa and Katrina are the Center Leads for the DEVELOP Program’s Goddard location. NASA’s DEVELOP Program is a student-led research internship that focuses on using NASA Earth observations to address community concerns and public policy issues. Katrina: During one winter quarter at UCLA, a DEVELOP student visited our Geography Department and gave a presentation on the program with examples of projects that had been completed. I was so impressed with how direct of an impact these DEVELOP students were making on their communities and how closely they brought NASA Earth observations to addressing environmental concerns. Before that point, I did not know how I could be involved with NASA, and had very little background knowledge on the agency. DEVELOP opened up an incredible opportunity to contribute to the agency and to the nation. 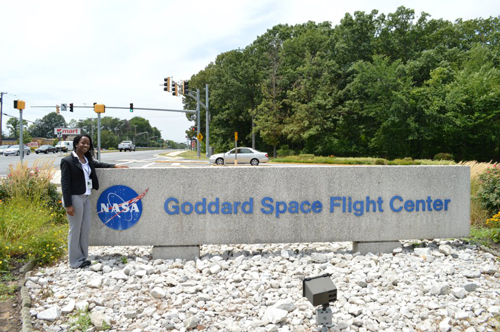 Melissa: I first read about DEVELOP at NASA Goddard in an email from my academic adviser the summer before my senior year of undergrad. My eyes widened and I knew it was an opportunity that I could not pass up and immediately began working on my application. I felt that this internship program was the perfect fit for me. When I applied, I was hoping for an opportunity to work with NASA scientists to use geospatial technology to examine issues in Earth science and apply what I had learned in school to real world problems. Little did I know that my experience with the DEVELOP Program would encompass all of the above and more! What interests you the most about Earth science? Katrina: On my childhood bookshelf was the World Book Encyclopedia Set (Children’s Edition). Along with my bicycle and my art supplies, this was probably one of my favorite possessions. I remember reading about incredible places such as Angel Falls in Venezuela – the highest waterfall in the world – the great depths of the Mariana Trench, the Mississippi River, Rafflesia flowers blooming in Borneo, and the Cape of Good Hope. This added to my curiosity about the natural world around me and inspired me to someday visit these places (I’m happy to say that I’ve checked the Cape of Good Hope off my list). The aspect about Earth science that interests me the most is studying the processes by which these natural wonders formed in great detail with the application of remote sensing, and to better understand how they affect us, and how we affect them. I am most interested in oceanography and biogeography. Melissa: Everything: its complexity, mystery, and beauty. The Earth is a reflection of many events that occur in life. It is so powerful. It is powerful enough to support life and provide all the resources needed to sustain life. And it is also powerful enough to be destructive at the same time. I am amazed about how everything on Earth is connected and how the Earth is always changing. By just walking outside and observing your surroundings, you can learn something new about the Earth every day. 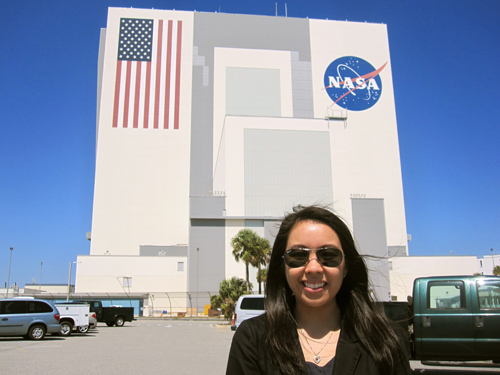 Melissa: Whether it is assisting with weather forecasting and emergency disaster management, or providing Earth observing satellite imagery for studying deforestation, NASA plays a huge role in my life and career both directly and indirectly. NASA is playing a huge role in creating tools to monitor the Earth, establishing historical records of changes that have occurred. It is up to us as Earth scientists to make use of all this data, understand it, and apply it for better environmental management and policy decisions. 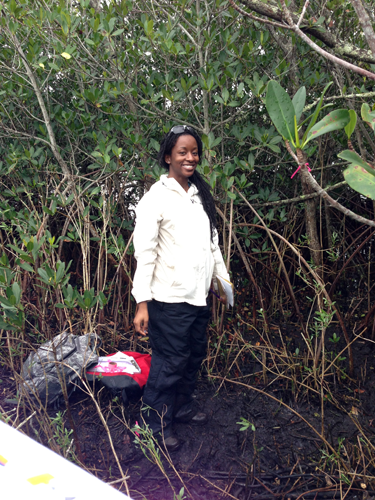 Melissa: So far, I would say that my greatest accomplishment is deciding to enter the challenging STEM field. I look forward to the many possibilites that will come about from joining this exciting and growing field. The sky is the limit! Katrina: I am very proud of how I have been able to directly apply my education in Geography and Environmental Studies from UCLA and in International Science and Technology Policy from GWU to my career experiences and vice versa. 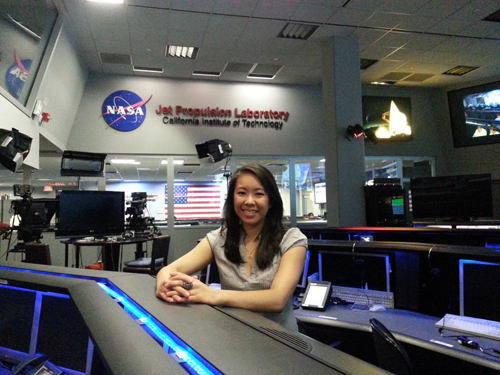 It was such a dream come true to have sat in my UCLA Geography Lab during Spring Quarter, conducting an ecological forecasting project using NASA Earth observations, and then to have found myself at the Jet Propulsion Laboratory (JPL) that summer working on a similar project! Being surrounded by incredibly talented and welcoming scientists and engineers and working at a legendary institution, it felt very surreal at times. Attending graduate school in Washington, D.C. has greatly engaged me with the policy community and enhanced my ability to communicate with a variety of end users. Katrina: When I entered college, I started as a Film Production major. There were days when I worked 18 hours on film sets or was stuck in the infamous Los Angeles traffic with multiple location film shoots. As a consequence, I have learned that the academic and career path you choose is also a lifestyle decision. I did not feel that this was the educational path and lifestyle I wanted to have. I loved film making, but I also loved studying the natural environment. After much consideration, I became a Geography and Environmental Studies major and I have not looked back since. I greatly appreciate the skills I gained from film school and still have a love for visual storytelling. With DEVELOP, we have filmed short documentaries of our projects for the public. Hosted by Earthzine, these videos are a fantastic way to communicate the benefits of NASA Earth science to a broad audience. I have enjoyed applying skills gained from film school to these videos! Melissa: I struggled withdeciding whether to enter graduate school directly after undergrad or waiting until after I gained some additional work experience. I decided to apply to graduateschool during my senior year to keep my options open. I was accepted into acouple of strong graduate programs, so when the time came to make a decision Iwas happy to have programs to choose from when I finally decided that I did want to go tograd school later in the year. I learned that it is good to keep your optionsopen in case exciting opportunities arise. Melissa: I would say that my family is the biggest influence in my life. They have instilled in me the value of being grateful for all the opportunities that come my way. They also inspire me to never forget where I come from and to give back to my community. Katrina: My parents and my sister are the biggest influences in my life. They always keep me grounded and endlessly encourage me to pursue my academic and career endeavors. My father is an architect, my mother is a registered nurse, and my sister is an EMT with aspirations for medical school. I am so inspired by their accomplishments and their perseverance between work and life at home and in school. They take pride in what they do and it is humbling to watch them in action. I am grateful for their love and support. How has your academic or professional career surprised you or given you unexpected opportunities? Melissa: In college, I studied Geography. I’m still an early career scientist. I never expected to be working at NASA completing earth science research projects. I was surprised about the amount of opportunity available with DEVELOP internship program such as working with amazing scientists, performing field work, attending seminars, and presenting my research. The journey has been amazing so far. Katrina: I am currently a M.A. candidate in International Science and Technology Policy, with a concentration in Space Policy, at the George Washington University. My research interests are in assessing the challenges of maritime security and disaster management in Southeast Asia and their implications for the economic, political, and security environments in the region. Katrina: Becoming a leader in the space industry. Traveling the world. Pursuing Earth science research in Southeast Asia. Engaging in science diplomacy. Integrating my educational and career experiences into humanitarian causes. Space travel. Melissa: I definitely want to stay in the geospatial technology field. With the growing human population and more people moving into urban areas, there is a need to address, manage, and analyze the ever-changing landscape and environmental concerns using specialized tools. I would like to use the skills I learn as a GIS/Remote Sensing Scientist to help manage and solve environmental issues that occur around the world and in West Africa in particular. I would love to be involved with projects that deal with agriculture and food policy, urban ecology, terrestrial ecosystems, wild fires, deforestation, and environmental health. Participating in the evolving African space industry has been a dream of mine as well. Melissa: Take advantage of opportunities made available to you. Preparation is key. Research, study, hone your craft, gain valuable skills, and know how to market yourself. And then go for it! It’s never too late to start over and work with what you have to reach your goals. Review the issues you need to overcome, make a plan, and begin from there. Katrina: Don’t second-guess yourself. Don’t doubt yourself or your abilities. Whether this is in speaking up at a meeting, participating in a class discussion, accepting a challenging task, asking for guidance from your science advisors, or in networking at a conference – those are just a few of many examples. It has been very challenging for me at times to follow through with this, but when I have done so, it has been immensely rewarding!